BUTAOTOME Acoustic Singing Vol.3 (豚乙女 歌うアコースティック Vol.3, Buta otome Utau Acoustic Vol. 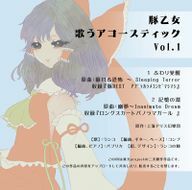 3) is a doujin album by BUTAOTOME released on 2014-02-23 (Gensokyo Summit 2). It features vocal arrangements of themes from Lotus Land Story. They are acoustic versions of two previously released songs. This page was last edited on 21 December 2016, at 21:33.